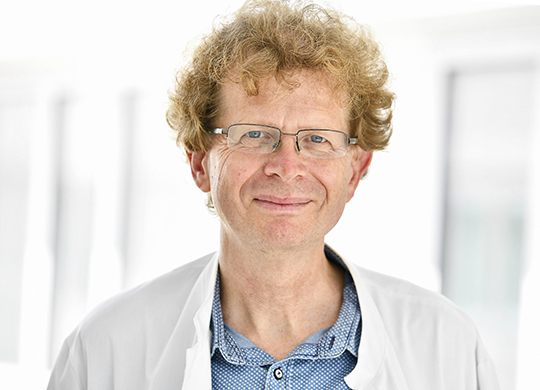 Lukas Radbruch has held the Chair of Palliative Medicine at the University of Bonn since 2010. He is the Director of the Department of Palliative Medicine, University Hospital Bonn, in Germany, and Director of the Palliative Care Centre, Malteser Hospital Bonn/Rhein-Sieg. Before this he was the founding Director of the Department of Palliative Medicine at University Hospital, in Aachen. He has been President of the German Association for Palliative Medicine since 2014. Professor Radbruch completed his Habilitation (the German equivalent of a PhD) in 2000, which was the first thesis in anesthesiology and palliative care in Germany. He has published extensively, his main research interests being symptom assessment, opioid treatment, fatigue, cachexia and ethical issues in palliative care. He is co-author of the new edition of the German textbook on palliative medicine (Lehrbuch der Palliativmedizin, Schattauer Verlag) and of the regular editions of the German hospice guide. He has been editor of ‘Der Schmerz’ since 2004, a member of the Drug Commission of the German Medical Board since 2004, and a member of the Expert Commission of the German Narcotic Control Agency since 2004. Professor Radbruch coordinated the project, Access to Opioid Medication in Europe (ATOME), which was funded by the 7th Framework of the European Commission. He has played a very active role in the European Association for Palliative Care (EAPC) of which he was President from 2007 to 2011. He has been a member of the Steering Committee of the EAPC Research Network since 1996, chaired the EAPC’s first Research Forum in 2000 and three EAPC World Congresses: in 2005, 2011 and 2013. He has also played a leading role in helping to develop the EAPC’s social media activities, in particular the EAPC online blog. Professor Radbruch joined the IAHPC Board of Directors in 2011, was Incoming Chair from 2012 to 2013 and has been Chair of the Board since 2014. He has worked with Liliana De Lima on the (successful) application for essential palliative care medicines to the World Health Organization (WHO) essential medicines list, and is a member of the WHO Technical Advisory Group initiated in November 2014. His main activity in this group will be focused on the development of WHO guidelines on palliative care. Outside of work, Professor Radbruchenjoys horse riding in the countryside, and being with his family. His two sons are grown up, one working as a veterinarian in Berlin, the other doing his Master’s in engineering in Aachen. He also enjoys salsa dancing with his wife.